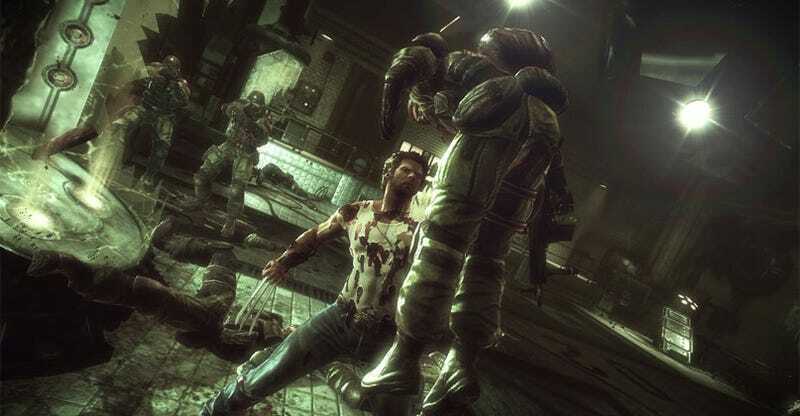 Has as good stand-alone Wolverine game finally been made? I tried out an early hands-on demo tonight of X-Men Origins: Wolverine at Activision's pre-New York Comic Con press event to find out. X-Men Origins: Wolverine is an action game based off the upcoming movie developed by Raven Software, which brought you Quake 4 and Soldier Of Fortune. The story focuses on the X-Men character Wolverine before and after he's given his adamantium skeleton. I found the gameplay closely resembled God of War, surprisingly. You'll be involved in plenty of tight, close-combat battles, as well as many platforming and playable, cinematic sequences. I demoed the first level of the game at an Activision party for the Xbox 360. I spent about 20 minutes playing before I kindly passed the controller on to someone else. The level mainly took place in a jungle setting filled with various soldiers equipped with guns and swords. While the jungle environment looked very robust, it was at times a bit too linear. I felt I was always going on straight path. This was the opening tutorial level, though, so perhaps the later levels get a bit more exploratory. I would also like to see more destructible environmental elements. The only breakable items seem to be clay pots. The grotesque violence. Seriously. I wasn't the only person there that was stunned at the amount of sheer brutality in this game. Normally, we don't really see Wolverine hack and slash people to pieces, usually just a punch to the gut with little to no blood. The opening CGI movie and the following gameplay, however, were almost disturbing. The Activision rep proclaimed this to be the way fans wanted to see Wolverine. Well, you guys got your wish. Prepare for a bloodbath! I also loved the leaping control. Being able to jump on an on-coming enemy and immediately start stabbing their guts felt very satisfying every time. This game has as much over-the-top violence as something like MadWorld. Wolverine uppercuts heads off torsos, jams enemies into the blades of helicopters. and even throws bodies onto spikes coming out of the floor. I know most movie-licensed games aren't very good, but this could one game that everyone will be talking about, even if it's because of the violence.